Jenny Quantum is a Hero from the Wildstorm Universe published by Image Comics. 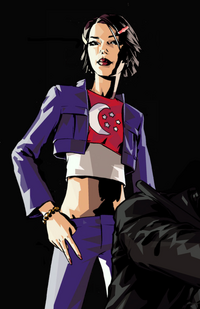 Jenny first appeared in The Authority #13 as a child and Authority: Revolution #7 as a teenager, although it could be inferred that Quantum is the newborn depicted in the last panel of The Authority #12 . Quantum is the corporeal spirit of the 21st century, and the youngest known Century Baby, as well as the reincarnation of the Spirit of the 20th Century, Jenny Sparks. Quantum forced herself to age several years into her teens so that she could better fight the threat of Henry Bendix and his evil group. While fighting Bendix, Jenny was able to free the current Doctor, Habib Ben Hassan, and enlist him in the fight against Bendix. It has been stated that Jenny Quantum's powers are far in excess of those possessed by her predecessor Jenny Sparks,("make her previous incarnation look like a spastic with a guide dog") and that she still is the most endangered of all. Dimensional Manipulation: Inspired by the Doctor's Garden of Ancestral Memory, Jenny created a dimension for all her ancestors called the Infinite City, a metropolis of assorted time-periods on the back of a giant turtle. Quantum Power Blasts: As a newborn she produced an energy blast of sufficient strength to disintegrate the legs of a giant who was attempting to kill her.